This is a book that will not sell. Not much of a marketing pitch to start with. But I am a wiser man now, after having written and published three books, and not really succeeding in convincing my friends and others to buy and read them. I am awake to the reality that there will not be many takers for this genre. Poetry? So why did I go through with it. Well, I wanted to see them in print and having decided that I was not going to incur any expenditure for the publishing I opted to have them published through the self-publishing platform Xpress of Notion Press (the publisher for my three previous books). What if I do not have an ISBN for the book (maybe later I shall have it done on my own) or the book not being made available on online store like Amazon etc, it will be still available in paperback from the publisher for purchase and I still get to order my author copies at the subsidized price. And of course, friends and others who are genuinely interested can order them from Notion Press at the link which is at the end of this post. This has been a thoroughly satisfying experience – going through the process of designing the interiors and the cover, of course Notion Press does suggest Templates that we can use, but the entire process of selecting the Font and Font size as well as ensuring that the layout comes out properly is our responsibility. Thanks to my daughter who gave me a painting of hers to use as the cover. In the final analysis, I am satisfied – a job well is done. In all my three books ‘I am just An Ordinary Man’, ‘Darkness and Beyond’ and ‘Autumn Leaves’ that preceded this collection of poems, it was an exploration of life, be it my very own or the lives of others that I undertook, to arrive at an understanding and accepting the reality of existence. But in a way the themes for these books were based on the diaries that I had kept and the jottings mainly in verses made over a period of more than four decades. In a sense this collection or rather a selection of what I still like to refer as prose-poetry is a means of recapturing the different phases of my growing up and thought processes. 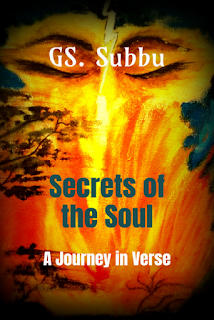 That is why I refer to this collection as ‘A Journey in Verse’. Slowly from my slumber I now stir. This city’s streets up and down. ‘Ghosts’ was my first attempt at writing. I wrote about the city that I had explored over the last six months, during what I now call as a self-imposed sabbatical. I explored every nook and corner – from the multi-storied affluence and the pulsating rhythms of daily existence to the life on the pavements, the stench of the gutters, and the streets with looming dark shadows; life sustained by the hope that there will be a next meal, that there will be a shelter when the rains come, a fight for survival and a hope, that there will be a better tomorrow. And groans to stay alive. …….. In the background there lurked something unseen: observing, but not intervening, leaving the happenings to play out as per the script. Leaves no footprints on the sands. ‘Ominous Patterns’ which forms a part of ‘Ghosts’ is a snapshot of Bombay with its various shades of grey that never ever left my system, though now I can say that with the passage of time, the ghosts have been exorcized. On a cold December night at Ellora, as I gazed at the Kailasa temple silhouetted against a star filled sky and the surrounding stillness, I found myself. A feeling of oneness with the world and joy was predominant. Even now when I try to recollect and revive that state once again, it does not happen. It was something mystical. Not that I did some great writing, I have always kept it to myself and enjoyed reading it again and again. It has been something very personal. There have been other moments that have overwhelmed and drowned me in ‘Rapture’. All this fervor’s magical chant. In my heart a passion gains. As my heart in fervor sings. Unshackled from the bonds of infatuation and having suffered the pangs of separation one moves through a sabbatical before he comes down to the harsh realities of life. The more my encounters in the external world, the more I started turning inwards to understand my relative existence. ‘Fragments’ is the result of these ruminations – from ‘Being and Nothingness’ to ‘Mere Words’. Follows me like an apparition. To perpetuate these moments, try my best. When will these moments ever last? And in the stillness of my mind? To finally merge with the sea”. Finally, in ‘Secrets of the Soul’, the imagery seeks to mingle the inner world of dreams and awareness with the happenings in the external world of things and events, seeking answers to the turmoil going on within. Here again the presence of the ghost is felt. I wrote, sometimes in spurts, sometimes in rhyme. Since all the writing was done after what I would call ‘my awakening’, a good portion of them have been recollections. 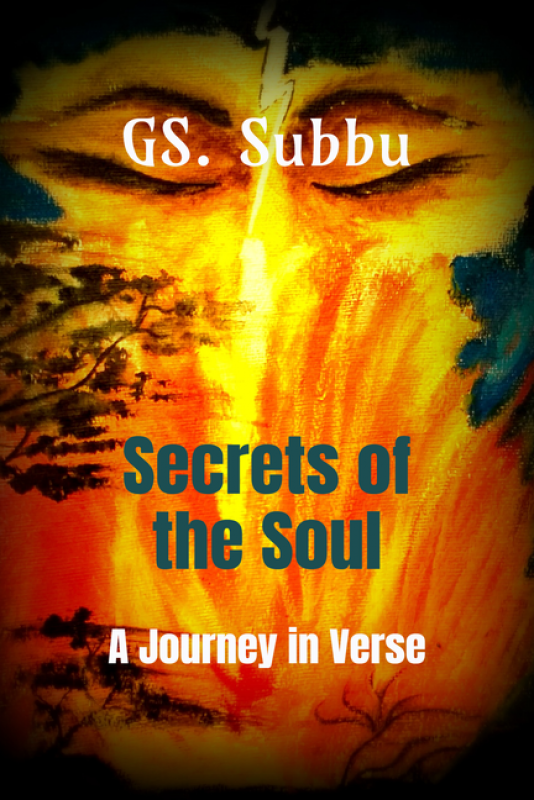 I have rearranged them in five parts – Ghosts, Rapture, Rebecca, Fragments and Secrets of the Soul to reflect the various stages of my journey and that is why I call it A Journey in Verse. It took me a long time to write down my thoughts, in bits and pieces, and it has been one long journey, but the secrets that I seek to understand never really end. Matunga the year is 1997, a muggy evening in late April. The milky clouds of the past weeks had curdled into thick cheese, blotting out the evening sun, raising hopes for a spell of unseasonal rain. The air felt slightly stale. Being outside was like taking an evening local train cramped up against a mouth breather. A light sleeper at best, Mumbai opened its eyes by 5 a.m. to the arrival of milk trucks on the streets. Local trains started to ply around the same time, carrying fisherwomen, flower sellers, and sleepy revellers up and down the arteries of the metropolis. And along these arteries, Mumbai awoke in slow waves, the farthest suburbs stirring first, readying themselves for the long battle that was the day ahead. At times there was nothing to say about Mumbai. More often than not, work had become one routine story braided into another, this meeting and that scheme, delays and excuses. To me it is still Bombay, and so will it be remembered by people of my generation. It is a relationship, an intimacy that is shared by everyone who has lived there. You may choose to hate it, but you will still love it with all its shades of grey. My time, of course, goes back more than a decade before the author was born, but it is the skill with she has been able to capture the passing years. Matunga of 1967 had yet to give way to vertical growth but with the growing population the movement to the suburbs had already begun and I did stay in one such suburb Chembur. 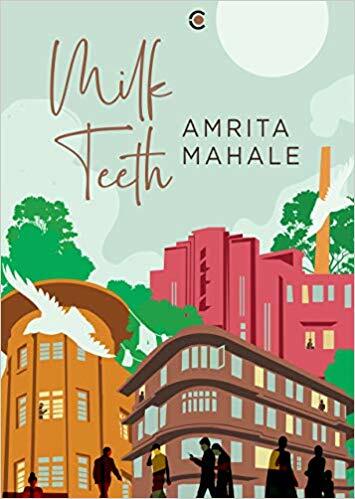 Her description of Matunga, King Circle, the South Indian restaurants and the most important of all – the Irani Café famous for its plate of pastries and the distinctive Chai, where one could spend time meeting up with friends, evoked memories of evenings of many a summer and monsoon spent there. Thanks to her brilliance as a writer she has brought to life ‘Bombay’ (Bombay became Mumbai after 1995). The story itself is simple, at the same time her probing of the psyche of the main characters makes the reader identify and empathize with them. there is no melodrama and she has maintained her integrity as a writer throughout. So for most practical purposes, the communal violence that started after the Babri Masjid fell came to an end after the blasts, but the spell of peace that followed felt like hate was only shedding its milk teeth. The receding wave reveals the debris the sea had kept hidden. Scattered on the rocks under our feet are plastic bottles, snack wrappers, a soiled diaper. Refuse that the water had obscured like love does. The walls, Kartik called this spot. The name sounds familiar, but I am not sure where I have heard it. In a magazine, perhaps? I feel the unpleasant tug of a sour memory. Ananya comes to mind, but why? The walls. The walls. In the distance, large oil tankers stand still. Closer, fishing boats bob up and down, anchored but still moving. It’s ten past six, sunset is at least ten minutes away. The Walls. Oh. To talk more about the book or the storyline will be unfair to the author. I leave it to whoever reads this review to buy and read the book in its entirety. With her first book, Amrita has shown her talent as a writer who I am sure will find her own place on the Indian literary scene. Wishing her all the best. I am posting this review of my books by a person 15 years elder and whom I have never met before. This was forwarded to me by a cousin who had lent all my three books to him since he is an avid reader. I am posting this in my blog since it cannot be posted on any other site and this a feedback on these four years I had spent in writing and completing the three books. I am immensely grateful to him for having made time for writing this review I thought I should share it with all the readers of my blog. This has given me the impetus to go ahead and start my next book. Subject: Mr Subbu & his Books. I am sending herewith my impressions of Mr. Subbu's books. If you are sending feedback on the books to Amazon, you are at complete liberty to Add, Alter, Amend and Edit this as you deem fit. It may be too long for a review on Amazon. You can yourself be the best judge. of that. I enjoyed reading the books and shall return them soon. Thanks for considering me worthy of reviewing them.
" When you settle down to read an autobiographical 'first' book by someone who had passed out from IIT Kharagpur, and then gone on to turn a Banker by profession, the very last thing you would expect is to be reading an account of his search for 'truth' within and, a conversation with himself, while deeply and critically examining his feelings, his thoughts, and his relationships with all those he came into contact with in his 'personal' life, particularly with the closest members of his own family. As someone 15 years older to him, I am struck by the remarkable depth of his insight into himself and the inferences, the feelings and interpretations that he gives to the way he sees others around him and his interactions with them. I find a striking similarity that surprises me, with my own experiences in his narration. Lucidity is the hallmark of his writing on an abstruse subject into which he has ventured, and he does very well to keep the reader engaged and involved, despite the book being a somewhat dry account of his own life and times, peppered with interesting anecdotes. I recollect reading a long time ago that, “When one approaches old age 'dotage' converts itself into 'anecdotage'." (Perhaps this is the reason why youngsters these days take to their heels at the very sight of an imminent and verbose grandparent). 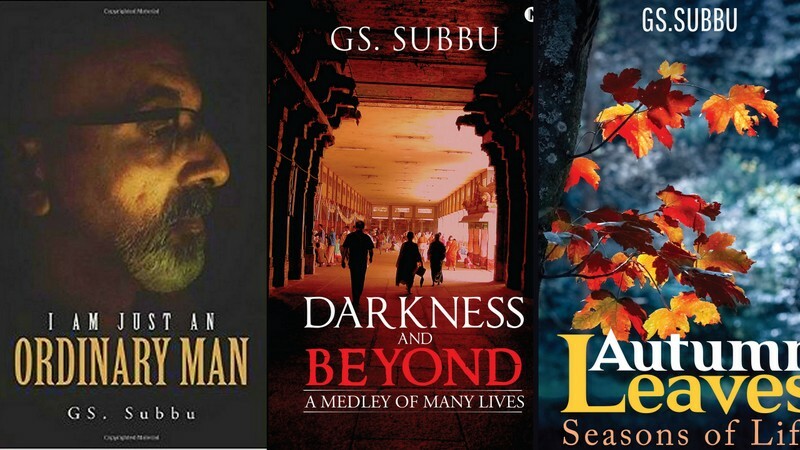 The difference Mr. Subbu makes in his narration is by embarking on a storytelling manner interspersed with incidents, small and significant, trite and pertinent, pleasant and morbid, which is what makes one read on and get on the same 'page' with him. (no pun intended). The human mind is similar to a churning sea, with myriad thoughts whirling around in it all the time, like the unceasing, inexorable waves and surf beating against the seashore, or the violent swirls in a whirlpool. Most of us are incapable of remembering, sorting and analyzing them, as we merely experience them and, fortuitously for us, forget most of them (Inability to forget can become a perpetual, haunting nightmare. Thank God for our forgetfulness). Mr Subbu has displayed a rare ability to recall even the smallest and relatively insignificant incidents, conversation, feelings and his own thoughts from a very long time ago in his life to be sufficiently inspired to compile them in the form of a long narrative. However, it is one thing to have a good memory of things that happened in the long past. Most of us have such memory. But to accurately recollect the contemporaneous thoughts, feelings and the ethos of particular situations and the milieu in which one existed, and to proceed to make a credible and interesting narrative out of it is a commendable exercise that Mr Subbu has succeeded in performing. It is said that the highest compliment that one can pay a writer on reading his work is to exclaim, " I wish I had said that". Mr Subbu has achieved that in his books, and more significantly so, as the subject of his books is hardly one that will have readers avidly rushing out to place preprint orders for their copies. This is all the more to be appreciated when one considers that Mr Subbu began with a solid foundation in the study of Technology and Engineering, and then veered off to the diametrically opposite field of Banking, spending all his working life in Banks with figures and Balance Sheets. One can easily perceive from his books that the dull daily humdrum of a Banking career did not deprive him of his sense of humor, as witnessed by occasional sparks of facetiousness and gaiety in his otherwise serious narratives. Most writers, even eminent ones, have confessed that writing does not come naturally to them and they have to concentrate, work and sweat to produce their offerings. Thus, to embark upon the writing of a book that could run into over 200 pages is in itself no mean task, especially for someone who was not into writing until after his retirement from active life. (A Diary can hardly be the same as a 'Book'). But, to find matter to write upon at length and, to hold the reader's attention all the way, needs strong confidence in one's own ability to write, besides possessing the talent to do so. That he has already written three books in quick succession is proof enough that he has both traits. My impressions on his books (and about Subbu himself) rely more on his first attempt, ' I am just an ordinary man' (Can't help recalling Rex Harrison singing exactly that as Prof. Henry Higgins in 'My Fair Lady') than on the next two renderings. I am sure he would have been inspired by the old saying, "Nothing succeeds like success", having found that it was after all so easy to write a 'Book', beginning only from randomly jotted down recollections of his experiences and feelings from a distant past.in a Diary, only to be taken out after his retirement and now converted into his three "Books". Perhaps, there is a lesson in it somewhere for budding writers. He is obviously very well read, as is evident from his narrations interspersed with quotations and references. I see that he has taken great care to keep his own writing style simple and readable. Fortunately for him, his long years in the dull occupation of Banking have not blunted his talent as a raconteur. I wish he had injected more of his sense of humor into his books, particularly the second and third books, though admittedly, the subject of his third book is perhaps too morbid for humor. I do hope he picks a ‘livelier’ subject for his fourth, which I am sure is already on the anvil. I am 83 plus, and I do not WANT to think of the inevitable 'Autumn', despite being so much closer to it. All the same, the subject of a book need not necessarily be a perfect reflection of the writer's mind, and the writer can be quite detached from the kernel of his book. So far, so good. 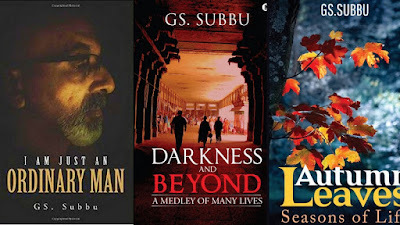 I shall end with complimenting Mr. Subbu, not only for the sheer effort and labor of writing three books in just four years, which is itself a highly commendable achievement but also for his style and narration of writing on subjects that are not designed to be popular with all readers. In 2014 I had written in my book ‘I am just an Ordinary Man’ what at that time seemed prophetic for it was a projection into an imaginary future. Four years later as I sit here writing I can’t help but wonder that it has come to pass. Though the timeline is stretched beyond the two years that I had indicated, the images are now very much real. I am reproducing the relevant portion of the chapter here. My wife and I just returned after a six-month stay with our elder daughter. This time we came back with the onset of winter, having spent the entire autumn there. I watched the brilliant colors slowly fade away and the leaves fall to the ground and before I left, I experienced the first snow of winter; a sheet of white shroud covering the ground and what lay underneath. It was once again a reminder of what lay in store; the end of a cycle. During my stay at my daughter’s place, I was soaked initially in the surrounding colors and above all in the company of my grandson. I was seeing him after three years. 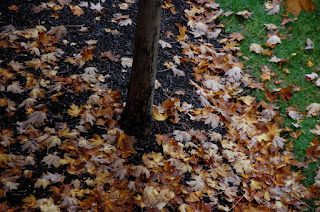 As I watched the leaves slowly turn brown and wither away, the rumblings started once again. My writings had been sporadic and as I read what I had written over the last one year, I sensed a lack of conviction in what I was trying to say. It was as if I had already exhausted myself and there was nothing more. 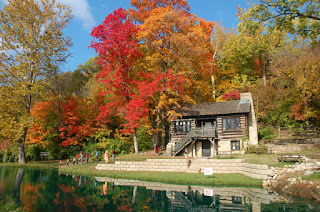 The year that has passed by has been satisfying with the publishing of my book ‘Autumn Leaves’ and subsequently the trip to the US to spend time with my grandson and daughter and revisiting the locations where I have based my books especially the last one and find that I have not erred much in my descriptions. 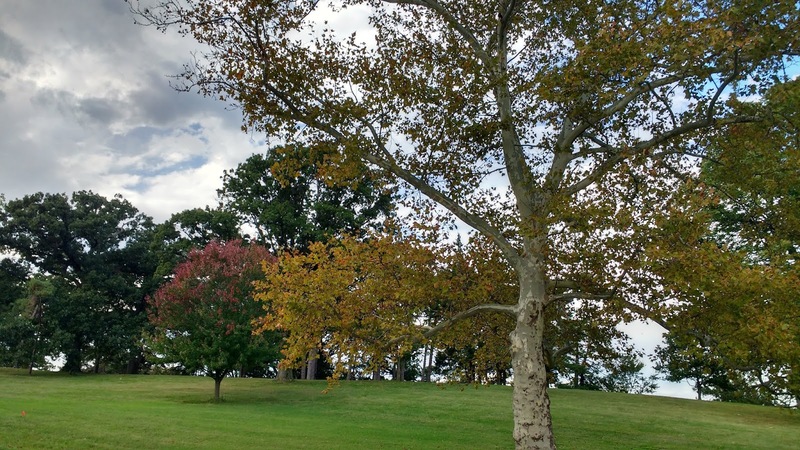 The colors and grandeur of the Fall and the looming grey despondency of winter are images that I carried back with me this time in the form of photographs which I took in abundance not wanting to miss the moments of transition indicative of the turbulence in our mind. 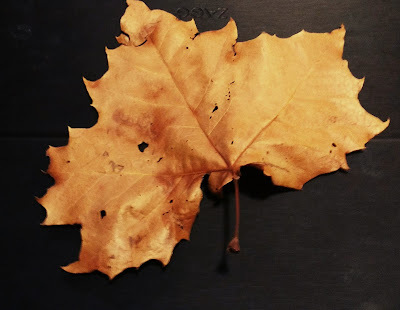 The winter chill had set in and with it, the last leaves of the sugar maple tree in the backyard floated, slowly drifted and fell to the ground. Soon the first flakes of snow would come and cover them with a white shroud. 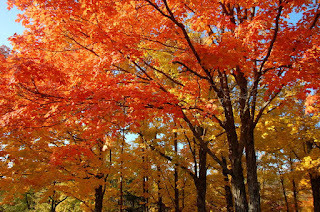 Vishwam loved the fall and the changing colors that seemed to envelop him all around. 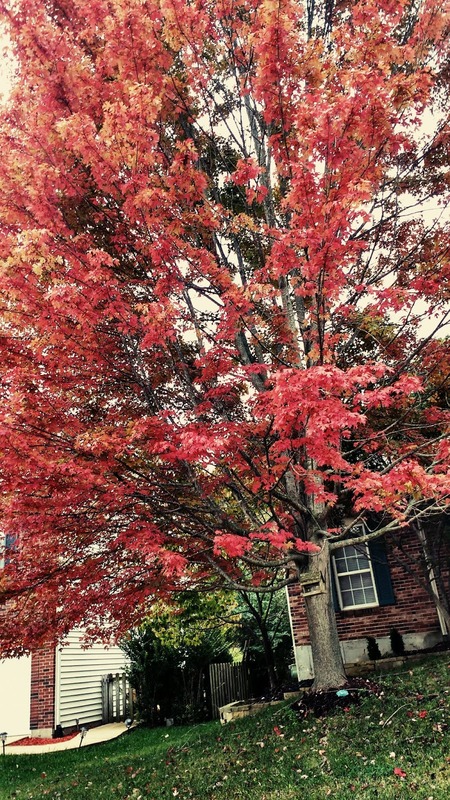 And as the leaves of the trees went through their complete cycle from several shades of green, then from yellow to orange, and finally to red in autumn, he would start feeling restless for he never wanted to see them turn brown and fall to the ground. He hated winter. However, I did not hate the winter. Just like I had drenched myself in the colors of Autumn, I watched the blizzard blow from the confines of the house and marveled at the changing landscape outside. The cold only made me feel more alive and resilient. It’s been a month since I came here hoping to catch the Fall and relive some of what I had written in my last book especially the changing colors of the leaves. 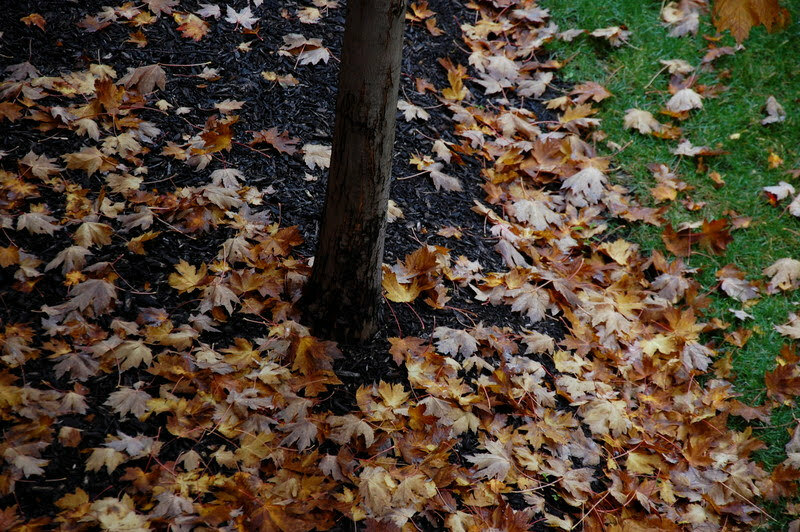 I often go to the balcony to look at the maple trees and all I have seen till date are the green leaves and some brown leaves strewn on the ground. I am still waiting for the color but in all counts, it could take some more time, two weeks I expect. But whenever I go out for a drive during the weekends for that is the only time my daughter finds time to take us out, I carry the camera along in case I sight a few trees heralding the arrival of the fall. It’s happening slowly, and I was able to capture a few spectacular ones, especially in the Forest Park and in the suburbs. 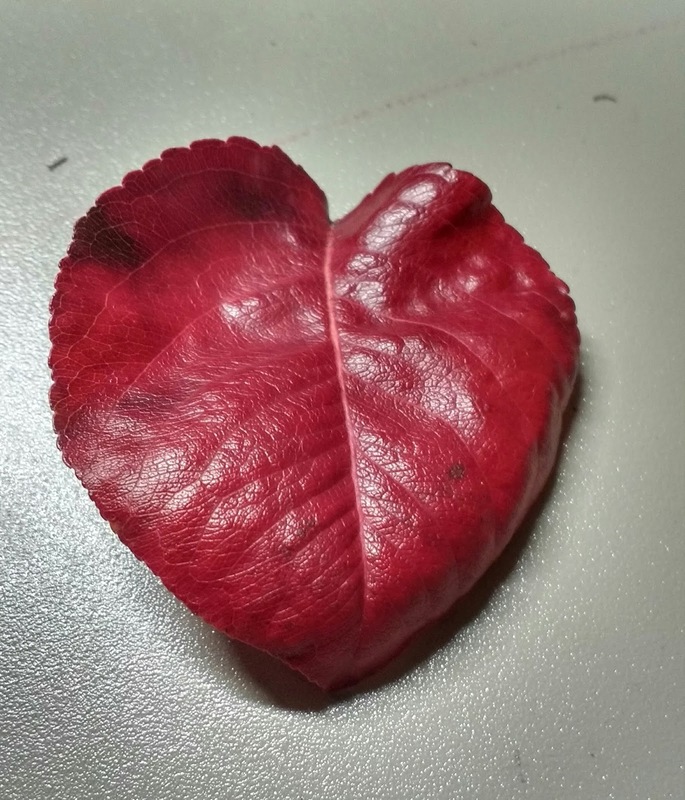 Every day when my grandson comes back from school, he digs into his bag and takes out one or two leaves that he had picked up from the ground. They are of different shapes, some dry and some adorned with different shades of red and orange. Then he would proceed to describe whether it was a maple or a sycamore. I wish I could have talked to him while writing my book; I could have embellished it with more color. Well, the wait continues and so do my hopes that more people find the necessary interest and motivation to get my book and read it. I feel this more and more for I think that this has been my best and most intense effort. But of late this enthusiasm is waning out and slowly it is being replaced by a sense of acceptance that is how it will be. Four months have passed since the book ‘Autumn Leaves – Seasons of Life’ was published. Though my expectations were never high I expected a decent reception as my two previous books though not great successes, they were decent in terms of sales as well as reviews. Social media is the only outlet for self-published authors (a post on which I had written earlier in my blog). The reality is that about 25% percent of the number of friends you have in the virtual world, respond with messages of congratulations and best wishes. Many of them stop with that and the job is done. Lesser people come out with reviews (a review is the most important thing for an author both in terms of exposure as well as well as having a critical look at his own work). 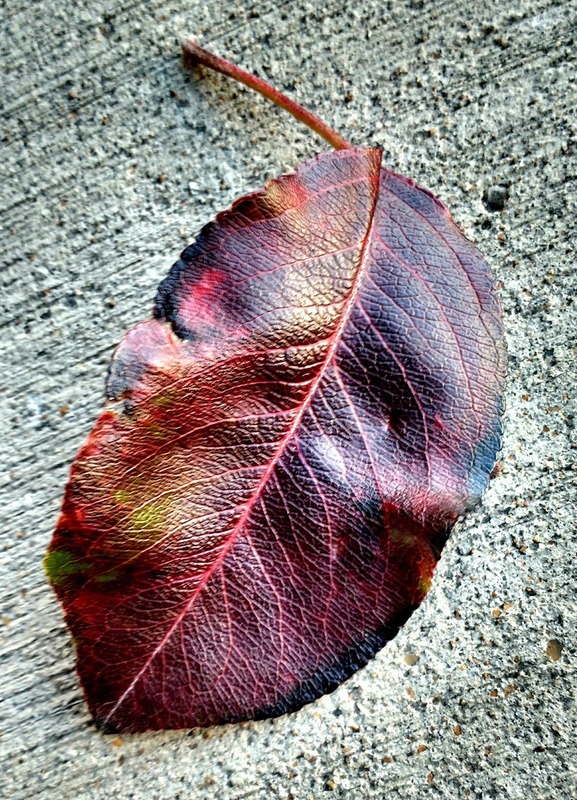 Like waiting for the Autumn Leaves to bloom so also I still wait. 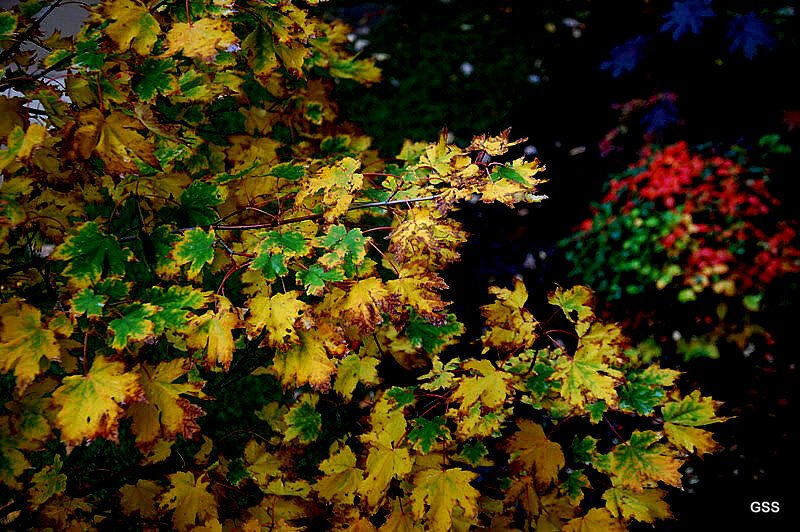 I do not want the leaves to turn brown and fall to the ground before that. I call this the reality check. But as the days pass I have slowly started to accept that I write because that is what I want to do and not give much thought whether others are interested or not. But it is a bitter pill to swallow. That is why I have of late stopped posting on my social media pages asking people to buy or write a review. If they do, I accept I will be happy. The reality is that writing books have given me immense satisfaction and taken me through an alternate world through the characters I create. Maybe the next book I write, I will rest content putting it on my blog and not spend my energy and resources in self-publishing. I do not have the marketing skills nor the necessary back up for that. I also resolve not to get carried away by the congratulatory messages and best wishes of friends on social media. I guess everyone has his own priorities and I am sensitive to that. 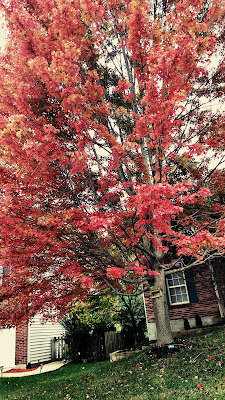 Meanwhile, I shall continue to share my joy by posting photographs of autumn and its colors. Maybe that shall bring some joy. I start this with a disclaimer – my intention is not to use this post as a marketing gimmick. I have learned a few lessons during my writing life. For me writing is not a profession, it is a passion. I have understood it more and more as I wrote my books. Recently a friend of mine from the old book club days at Gandhinagar, Gujarat, Ms. Elizabeth Koshy came out with her book ‘A Palimpsest’. Ms. Koshy a prolific writer and contributor to various newspaper and journals, the book is a collection of her writings over four decades. She is also the founder of the Chaitanya School at Gandhinagar. While talking to me she said that the proceeds from the sale of her books will go towards charity. That I thought was a very noble thing to do and it set me thinking. For people like us who have been endowed with decent means to sustain ourselves and need not look towards making gains from the sale of our books this perhaps is one of the ways to give back something to those who have for no fault of theirs are leading a life devoid even of the necessities of life materially and on an emotional plane. During my writing life, I have had the opportunity to observe life more than I would have done earlier; perhaps I have had more time on my hand especially after retirement or maybe it is due to the awakening to the realities of existence. It has not been possible for me to indulge in activities that require physical exertion. It is the truth that I have not been able to contribute meaningfully to such causes because I did not know how. But now I know that I can make a difference through what I think I do best – writing. It is not that I write blockbusters and earn a lot of money – I even have trouble making my friends buy my books. I have asked myself the question ‘Why I write?’ many times and have not been able to truthfully answer it. Is it because I want to get across to others so that I am understood as to what I am or because I am trying to understand more about the world around me? Or is it because I am seeking recognition and adulation or want to be a commercial success? It could have been a combination of all these. But I know one thing, I write because I like it. I also like it when someone says that they like what I write. My travel through my books have brought me closer to understanding myself, empathizing with the lives I am surrounded by and I feel I have become a better man. The latest book ‘Autumn Leaves – Seasons of life’ takes me further in accepting the reality of aging parents and the loneliness that overtakes them. I have looked at physically challenged persons and the irrelevance of old practices which weighed heavily against women, in ‘Light in the Darkness’ and ‘A Tale of Two Widows’ respectively in my earlier book ‘Darkness and Beyond’. In ‘I am just an Ordinary Man’ I have asked myself questions and tried to shed myself of the hypocrisy I had surrounded myself with. My writing is therefore centered around emotions and how hope plays a large part in making our lives more meaningful. I have not felt this more than what I went through while writing ‘Autumn Leaves’. The intensity reached its peak while I was writing the last story ‘An Enigma’. It was time that I also make a small contribution to such causes that can in someway alleviate the sufferings and enhance the quality of such underprivileged – orphans and destitute. Taking a cue from my friend Ms. Koshy I have also decided that the proceeds received from the sale of all my books will go to such causes. I know a lot of my friends are also involved actively in philanthropic work and would welcome their suggestions in this matter. I know my limitations as a retired pensioner, but still, I would like to make a difference. I have decided to start with a small contribution (initially not connected in any way with the sale proceeds of my books) towards one such cause, maybe a drop in the ocean, but I am sure that it will give me the satisfaction that I can make a difference through my writing. A small gesture is all that is needed. Let us in our own ways make a difference.